It’s a question I am asked a lot. Can jewellery carry memories? Jewellery is something with which the wearer can identify and express their personality. It also has the power to recall precious moments. Some people even say that they feel naked without their jewellery! Actors and actresses often remove their jewellery before getting into a character as these personal items carry too much of their own persona. My own memories around jewellery relate to my childhood. I was fascinated with the unusual, delicate pieces my Mother wore which were mainly carefully chosen by my Father. 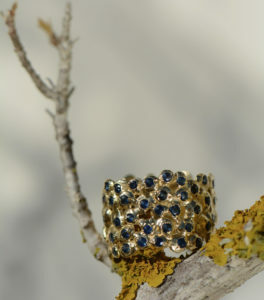 I loved the way she mixed her jewellery which consisted of very contemporary hand-made pieces by artisans. The aesthetic of her unusual, irregular jewellery has grown on me subconsciously and has certainly inspired me to design my collections with the irregularity of my signature hand-shaped gold nuggets. Commissions are always interesting and challenging because I need to design one-of-a-kind unique pieces. I have to take into consideration what the customer is wanting without moving away from my own aesthetic and signature style. It’s just a question of reaching an understanding and a balance between my creative input and the customer’s wishes. 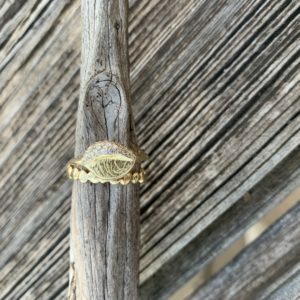 A client will often come to see me with a hand-down piece of jewellery that has sentimental value to such an extent that it has become part of their lives, even from their childhood. It is often a one-stone traditional piece. which they can connect. Sometimes a customer will come to me with a necklace she inherited but could never feel happy wearing. 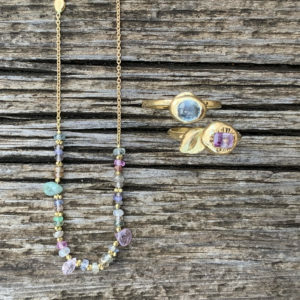 I remove all the stones and work them with my gold nuggets into entirely new pieces that reflect my style made to match the customer’s every wish. You can also ‘cleanse’ your gemstones with the rays of the moon which are energetically very clearing and cleansing as well as energizing. 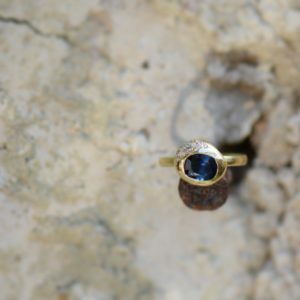 The jewellery piece can be placed in a window, outside or somewhere where the gemstones can soak up the moonlight for the night. Smudging is a quick way to clear gemstones. To ‘smudge’ them or remove any negative energy, the gemstones must be passed several times through the purifying smoke of burning cedar, sage, sweet grass or incense. I have to be positive when I’m making new pieces with their own settings, even a new ring for the shop has to have good energy and positive vibes. Particularly when I’m making bespoke wedding bands. I sit there quietly and create it, making sure that I’m in a good space and I stop working on it when I’m not in such a great moment in myself because I don’t want any of my negative energy going into the process. I feel superstitious and want to avoid putting any bad vibes on their union. I always hope that all the people I’ve made wedding rings for are still together.